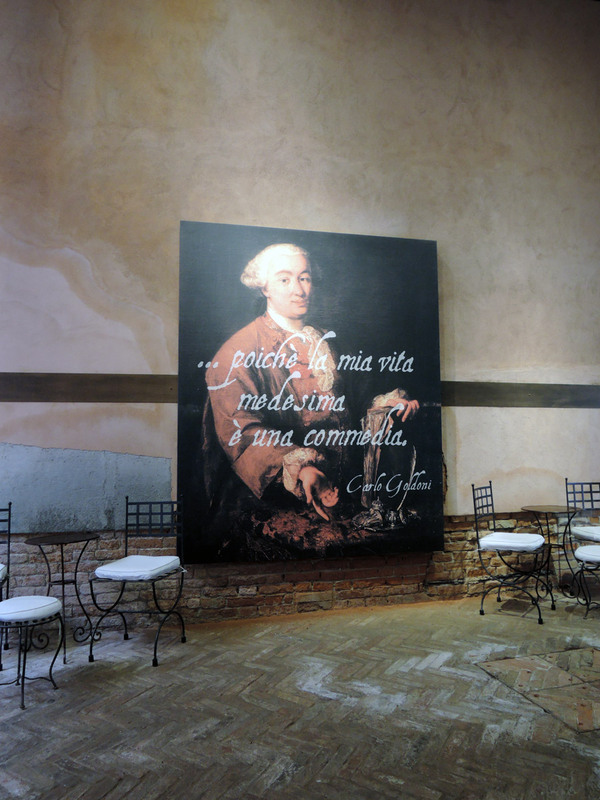 Goldoni House in Venice is worth a visit? 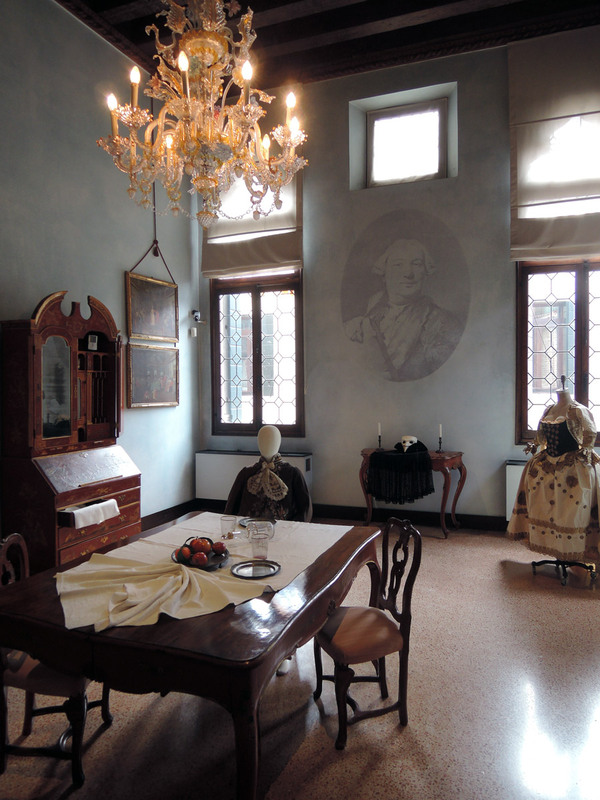 The so called Goldoni House is actually one of the 9 different houses where he lived in Venice. This is the one where he was born and lived until he was 12. It is a small Gothic palace called Ca’ Centani, dating back to the XV century and located in the San Polo Sestiere. It now hosts a tiny “museum” and a library (specialized in theatre studies, accessible only to scholars prior authorization). I tried to reach Goldoni house looking in Google Maps for San Polo 2794, as the official website indicates. But I ended up at the door of the “Centre de Musique Romantique Francaise”. The address is wrong! Or, at least, it is wrong on Google Maps. Luckily a gentleman was going out of his home in that precise moment. So I asked him for the right directions. I had to go back direction Frari Church, Campo San Tomà and then search for Calle dei Nomboli, that was the right address! Something about Carlo Goldoni: Attracted to the world of the theater since he was a kid, he wrote his first comedy plot at the age of 8. Forced by his family to study, he graduated in law from Padua University in 1731. As a practising lawyer, he continued reading Italian and foreign playwrights and composing several works, until he got his first commission for a theatre in Venice in 1747. Thanks to Goldoni the modern Italian theatre begins. In fact he was able to represent the themes and the key issues of his contemporary society with irony but at the same time depth, becoming the “Italian Molière“. Among his most famous works there are: Il servitore di due padroni, The Servant of Two Masters (1745), I due gemelli veneziani, The Two Venetian Twins (1747), I rusteghi, The Boors (1760) and Le baruffe chiozzotte, The Chioggia Scuffles(1762). Beyond the Ticket Office (the lady gave me a booklet containing further information about the author, his comedies, etc, which is also available in English) you enter the pleasant covered courtyard, equipped with some tables and comfortable chairs, a map of Venice showing the position of the 9 houses in which Goldoni lived and some panels describing the first years of his life (only in Italian). After the break I climbed the beautiful staircase (but I think there’s an elevator next to the Ticket Office). 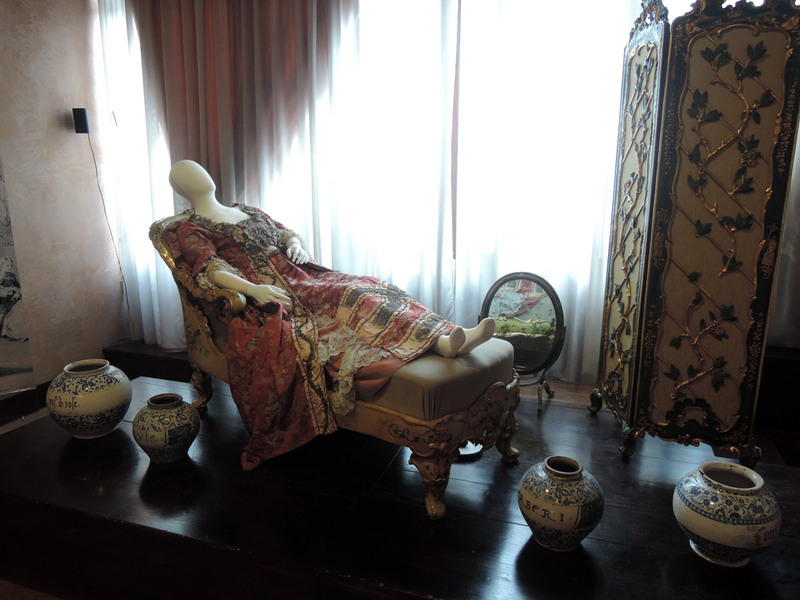 The museum at Goldoni house consists of 3 rooms + video room. I tried to read the booklet they gave me but (strange but true) it had too much information, data, facts, whatever and I got tired of it soon, plus it was difficult to find what to read when, and where and why: too messy. Room 1: Here you can see an Arlecchino costume, used during modern theatrical performances of Goldoni’s play “Arlecchino servitore di due padroni”, some letters, photos and memorabilia belonging to some Italian actors (Emma Gramatica), a Goldoni portrait, 2 writing desks (I didn’t understand whose they were… Oh my God, is this sentence correct????? No idea) and a wooden dormeuse recalling a Goldoni comedy, entitled “La finta ammalata” (The fake sick). Room 2, The dining room: Beautiful chandelier, a wooden table with chairs and other 18th century pieces of furniture, a costume, some porcelain objects and some paintings on the walls describing aristocracy life at the time of Carlo Goldoni (The Kitchen, Lunch with masks, The music lesson, The Concert, etc). Even with that I had problems! There were no tags on the wall and, though following the booklet, I wasn’t able to find or to recognize some of the listed paintings. Video room: I entered and stopped to see the documentary about Goldoni (in Italian). Since it was a cold day and I didn’t feel like eating outdoor, I grabbed the chance to eat the sandwich I brought from home. the puppets theatre, but the museum is minuscule and quite bare. I suppose it is worth a visit if you have the Museum Pass and if you’re curious to see the little theatre. Or if you’re a big Goldoni fan.